I’m a female in my 30s, and despite the fact that I just admitted my age, I’m feeling happy right now – writing to you. Just as Bryant was happy when he recorded the Feature Friday tip talking about facial detection measurements (see below). Facial detection cameras collect anonymous data (they don’t know my name) but can report: gender, age range, emotional state, peak days/times and dwell time. By placing a camera subtly within your brand activation, we can provide an audience profile of participants. If I walked into your experiential marketing footprint, wouldn’t it be nice to know all of this about me? Wouldn’t you want to know how long I stayed engaged with your brand experience? Or which stations inside your brand experience kept me engaged the longest? We are able to include this level of reporting – all with the simple use of a facial detection camera. It helps us draw insights from the brand activation and its audiences. For example, during one food truck mobile tour, we learned the large events drew more impressions but it was the smaller events that drew 3,400% longer dwell times. While reach is one metric we, as marketers, are often concerned with, the experience was far more engaging at the smaller events. We were able to impact attendees with longer, more quality engagement time. Isn’t that what experiential marketing is all about? As another example, a healthcare brand was aiming their product at seniors. We identified events and locations that attracted a large 65+ crowd. However, the data showed a lot of participants in their activation were actually busy moms instead. These moms engaged longer and found the product just as beneficial as the older demographic we had originally planned to reach. We recently worked with a CPG brand, which assumed a lot of females would be hitting up their sampling vehicle outside grocery stores. 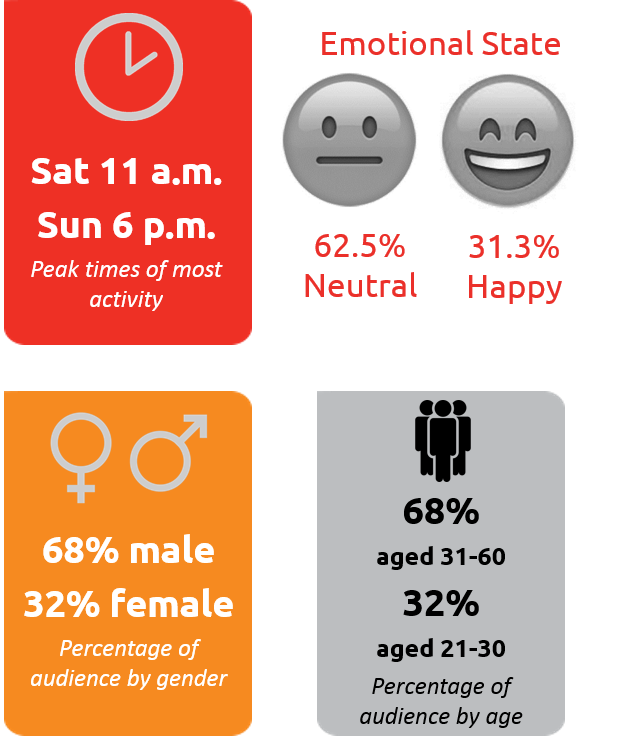 However, we reported back that the sampling activation actually attracted 56% male participants. With better quality cameras these days, we can also measure impressions in two zones. Up close impressions are those right within our footprint and engagement area. These are the most engaged people who are directly interacting with the brand. Those impressions just beyond our experiential marketing footprint are crowd impressions. The crowd can still see your logo and your experience, but maybe they’re walking by instead of coming into the branded area. We still make an impression, but we don’t have that same level of engagement. It’s important to break down these two level of impressions when we report back the data. In addition to the facial detection camera – a plug-and-play solution that doesn’t take much upkeep on a campaign – we also do track activity manually. Most of our campaigns leverage clickers. A brand ambassador can click for each participant who enters or for each sample given. But as you know, there is a small human error rate. Having the facial detection camera on-site provides back-up data and keeps us honest and transparent. These insights fall within the larger story. We’re also reporting on qualitative information, such as attendee reactions. We can also pre- and post-survey to gauge additional responses. And depending on your other key performance indicators (KPIs), we will report back a range of data to help us understand the campaign’s effectiveness. Your experiential marketing report will include a robust amount of content, all customized to your campaign. If you’re interested in learning more about facial detection, please request a sample post-campaign report. We’ll be happy to chat about how adding facial detection technology to your campaign is a low investment that provides maximum insights!